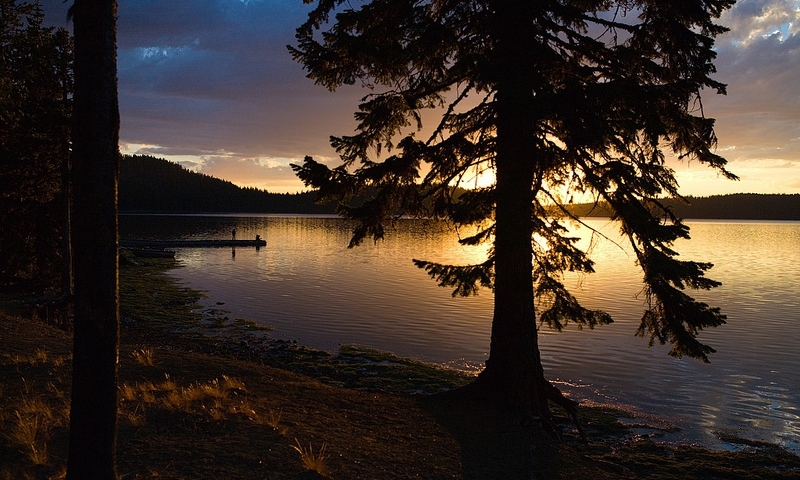 One of the numerous attractions that comprise Newberry Volcanic Monument near Bend, Oregon is Paulina Lake. One of two lakes that occupy portions of the caldera at the summit of Newberry Volcano, Paulina Lake is the larger of the two. Although called "twins" the lakes are not identical, but do have many things in common. The crater or caldera at the summit of Newberry Volcano encircles two lakes and is approximately five miles in diameter. This crater was formed more than 500,000 years ago due to the volcanic activity in Central Oregon. Paulina Lake is the larger of the two lakes and lies to the west of the other lake – East Lake. This particular lake was named for the Snake Indian Chief Paulina. Paulina Lake is fed by hot springs, snowmelt and groundwater flow from East Lake. The outlet of water from the lake is called Paulina Creek. This stream of water flows westward into the Little Deschutes River. Paulina Creek has carved a narrow gorge through the caldera's west wall creating a scenic twin waterfall. Thermal vents and hot springs along the lake's northeast edge have created a diverse ecosystem. The lake covers an area of 1531 acres. The average depth of the lake is 163 feet with a maximum depth of 250 feet.